* The Muslim Ban. * White supremacy and terror. * Environmental deregulation as the planet burns. * Open misogyny and theocratic restrictions on abortion and even birth control. * Stripping away rights recently won by LGTBQ people. * 8 million on the verge of starvation in Yemen due to U.S. backed war. * Threats of nuclear annihilation. * A thoroughly fascist Trump/Pence Supreme Court for generations. We know enough to see what has been put into motion. If we allow them to get away with caging and torturing children, they know there is nothing they can’t get away with. We must not allow them to pack the Supreme Court and wipe out women’s right to abortion, LGBTQ rights, and more and worse. Every crisis this regime gets through strengthens the regime. This is a shock we cannot normalize. We—the masses of people—must act to stop this whole fascist program and demand that this illegitimate, immoral, regime be removed from power. This cannot wait until November. The Trump/Pence Regime will not be bound by the normal political process—they are shattering norms, remaking the courts, radically altering the whole political and global landscape. The Democratic Party will not stop this. For them, empire and order is more important than justice, even if that means the order of fascism. 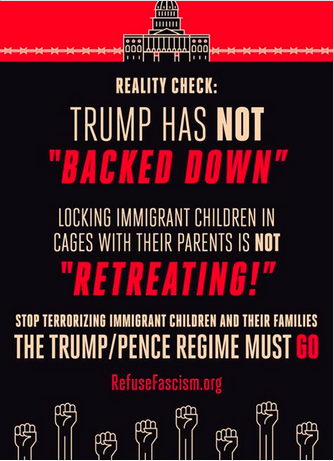 On July 7th: Join Refuse Fascism, mobilize your organization or your friends and neighbors and take to the streets across the country to raise the demand: This Nightmare Must End: The Trump/Pence Regime Must Go! Honolulu: 6:30 pm Meet at Honolulu Zoo (corner of Kalakaua & Kapahulu). March through Waikiki. Houston: 5:00 pm at proposed Immigrant Detention Center 419 Emancipation Blvd. The entire film with Q&A & sharable clips is here.